Personalized Oval Address Plaque with Clover Border - - one line or two line 13.25" x 8" oval address sign. Made in USA. A garland of alternating tiny white flowers and green clover surrounds the address and accentuates the oval shape of the sign. The one-line version holds five 3" characters or up to twelve (12) 1.25" characters (including spaces). The two-line version holds five 2" characters on line 1 and up to thirteen (13) 1.25" characters (including spaces) on line 2. If you are purchasing a one-line sign, please leave the Address line 2 input box empty. Wall mount. Includes mounting hardware. 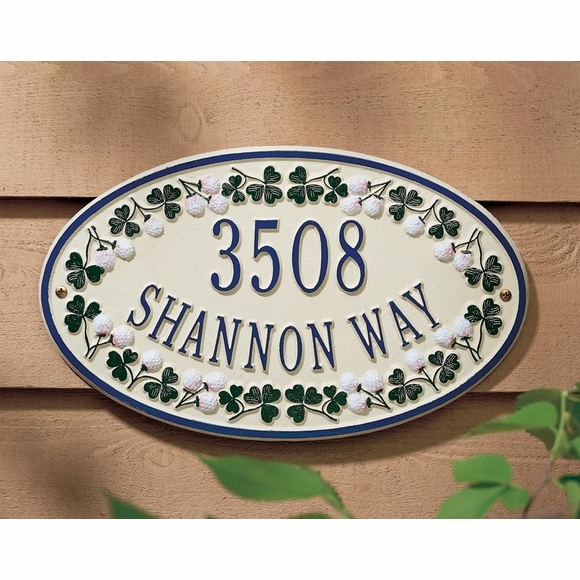 One or two line 13.25" x 8" clover address sign.